How are those healthy new year’s resolutions going? Have you been sticking to your healthier eating plan? I’ve been making healthier choices for over a year now and it’s going quite well. I’ve lost over 25 pounds and I’m feeling more energetic with exercise now added into my daily routine. Some people have asked me what I’m doing for exercise & I’m happy to introduce them to Briana and the Bikini Body Mommy community. I’m on day 32 of 90 in the Bikini Body Mommy 5.0 challenge and it’s going quite well! I wasn’t completely out of shape when I started but I wasn’t a regular exerciser either. The program is challenging for me but it’s nothing I can’t handle. Her 6.0 live challenge just started this month but I started on the 5.0 series through YouTube (yes, free!) so I’m going to see the 5.0 challenge through to the end before moving on. 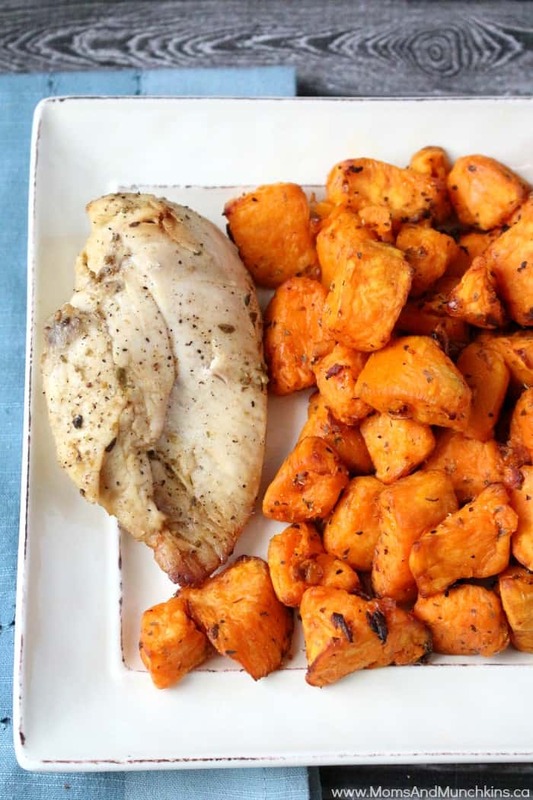 Regular exercise really does increase my appetite so I make sure I have lots of healthy food available to eat like this lemon chicken recipe with oregano sweet potatoes. 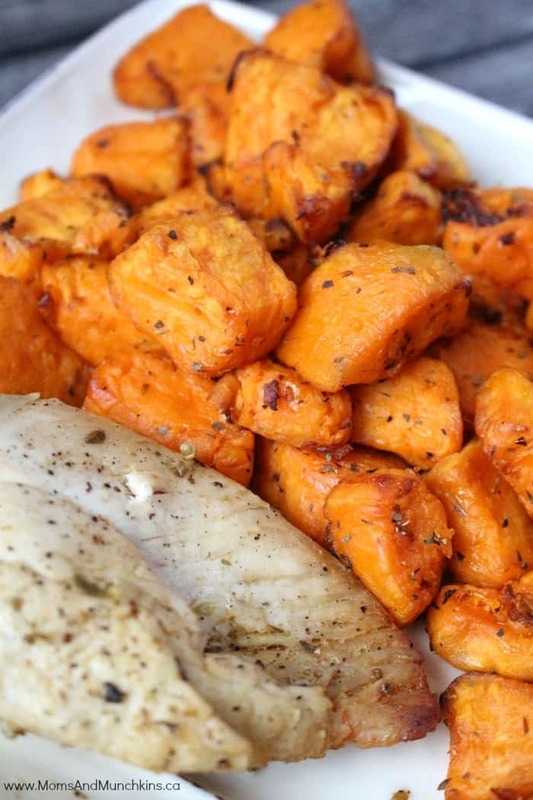 I paired this lemon chicken with delicious oregano sweet potatoes. These are super easy to make – just peel the sweet potatoes, chop into bite-sized pieces then toss with olive oil, oregano and a little bit of salt & pepper. I fry mine in my T-fal Actifry (for about 25 minutes) but you could bake these in the oven instead. You’ll want to prepare the marinade in advance so the chicken has at least three hours to marinate before baking. When you remove the chicken from the bag of marinade, make sure you dispose of the leftover marinade. Since the marinade bag had raw chicken in it, you cannot reuse that marinade. In a large sealable plastic food storage bag, mix together the olive oil, lemon juice and all the spices. Add the raw chicken into the bag, seal the bag completely then shake well to mix. Place this bag of marinating chicken in the refrigerator for at least 3 hours. I always put the food storage bag inside another grocery bag just to make sure there are no drips or leaks in the fridge. Remove chicken from the marinade bag and place chicken into a baking dish. Dispose the remaining marinade & food storage bag. Bake for 40 minutes (20 minutes on each side) or until the chicken is cooked thoroughly. 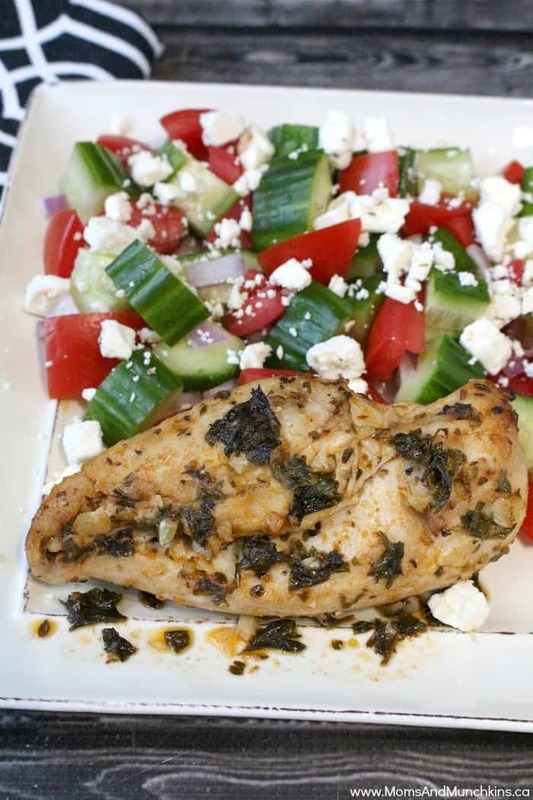 For another healthy chicken marinade recipe, check out this Mediterranean Chicken recipe. 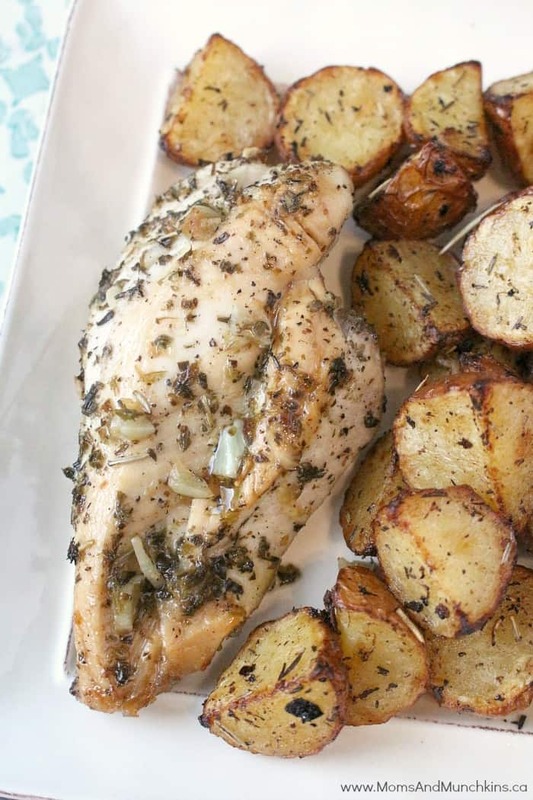 Or this Greek Chicken & Potatoes recipe. We have lots of delicious recipes for supper, desserts, appetizers and more on our recipes page. Follow us on Facebook, Pinterest, Twitter and Instagram for the latest updates.